You don’t have to say “yes” to every new project opportunity. In fact, saying “no” to the bad opportunities can save you from unnecessary stress, heartache, and loss of money. But how do you know which projects you should take and which you should leave? I’ve created a system to help you analyze a new project opportunity. This is the best version of something I used at my agency for the past decade. It is time for you to KNOW in advance which projects will be winners and which will be losers. Watch the videos and download the FREE PDF. Let’s learn how to analyze a new project opportunity! Learn how to analyze a new project opportunity by considering 20 different criteria. This video explains each element in detail and will help you say “yes” to the right projects and “no” to the potential disasters. Watch on YouTube! I’ll teach you how to ask your potential client the right questions so you can determine whether a new project opportunity is worth your valuable time. You’ll never walk into a client discovery meeting without confidence again! Watch on YouTube! What’s Inside the FREE PDF? Discovering whether an opportunity fits the “right client, right project, right price” criteria requires a two pronged approach. First, you must do a little research on your client and ask the right questions (New Project Interview). Second, you need to analyze the right criteria and make an educated decision as to whether you should take on the project (New Project Analysis). This document contains the template for each of these two task. 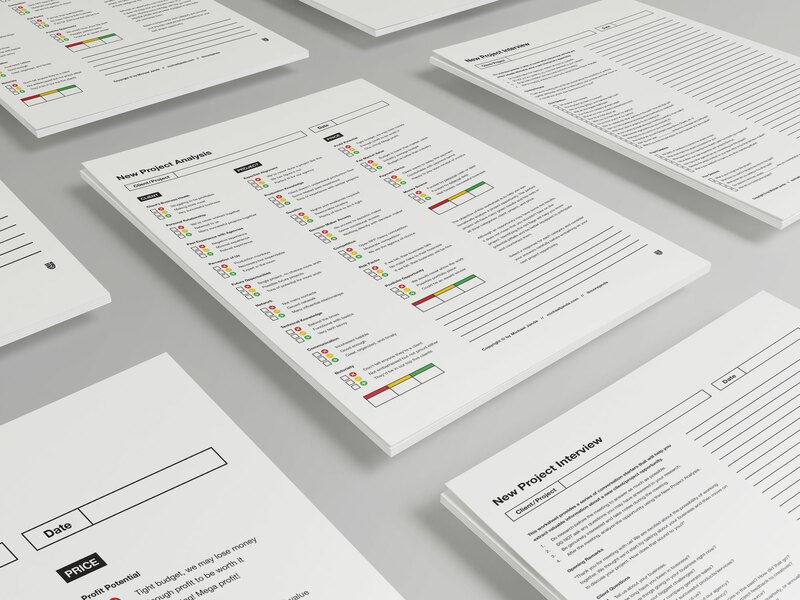 NEW PROJECT INTERVIEW: This sheet contains a series of questions to help you gather the necessary information you’ll need to properly analyze the project opportunity. 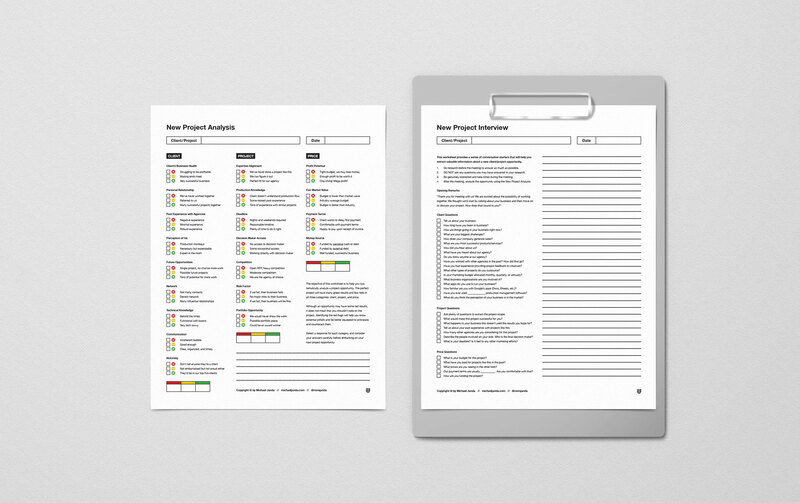 NEW PROJECT ANALYSIS: This sheet contains 20 elements of the project opportunity categorized by client, project, and price. Each element contains three possible answers. A red answer is negative, a “red flag.” Yellow answers are “fine,” they likely won’t hurt the potential success of the project. Green answers are positives, usually contributing to a high chance of a successful project. My recommendation is for you to print the document as a two sided sheet. Use the New Project Interview as the front side during your client discovery meeting to ensure you ask the right questions. Following the meeting, use the New Project Analysis to analyze the opportunity. At the bottom of category, there is a space for you to total the number of red, yellow, and green responses. Needless to say, the more green responses a new project opportunity has, the higher likelihood of success. On the contrary, a lot of red marks indicates some risk in the project.